Save the date for Raid the Park on June 7, 2019 at 7:05 p.m.
Register today for the 26th Annual Pierce College Scholarship Scramble! This year golfers will be teeing off at The Home Course in Dupont on Thursday, August 15, 2019. The Scholarship Scramble supports the work of the Pierce College Foundation. See the video below to meet some of the students who are impacted by the possibilities created by the Scholarship Scramble. 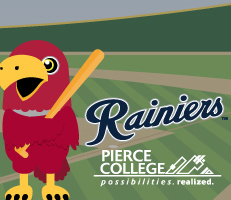 The next session of Pierce Talks will take place in September 2019 on the Puyallup campus. View photos from the 2018 Scholarship Appreciation Luncheon on Flickr.